One of the sessions I attended at JaveOne this year was about games and Java. In that session one of the speakers mentioned Slick, a Java 2D engine for games that provides more or less everything one needs to write a game. And indeed, after spending a few hours using it, I think it’s true that using Slick it’s very easy and fast to implement games in Java. Slick comes with several source code examples of how to use it, but, unfortunatelly with only limited documentation; the Slick wiki as well as the API Javadocs (though I found the forums to be of a great help). This is the only drawback I see. I think that the people behind Slick need to write more documentation of how to use it since many people, especially new developers, might not be able to follow the source code examples. Ok enough talking, lets see how we can write a very simple game using Slick. 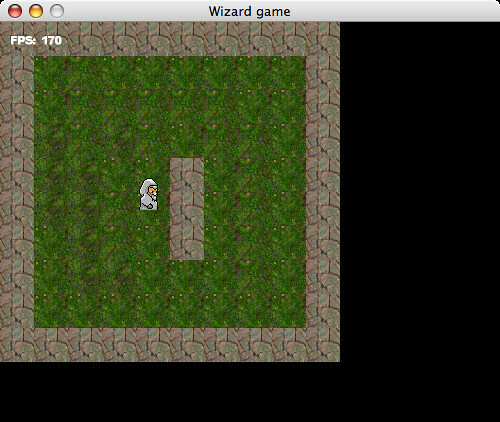 Our game will consist of a map, a sprite, animation of the sprite and collision detection when the sprite hits a wall. It’s a very simple game, the purpose was just to see what Slick is and how easy it is to write a game. First download the Slick libraries from the Slick site. I downloaded the full distribution and unzipped it on my hard drive. The full distribution contains the slick.jar file, several other libraries, example source code as well as the native libraries necessary to run the games. Lets start by creating a project in NetBeans. Go to File… New Project… Java Application and create a project. Once you create the NetBeans project you should also create two directories in the project folder. You can create them physically (outside NetBeans) or through NetBeans if you do a right click on the project and choose New… Other… Other… Folder. I call mine natives-mac and data. 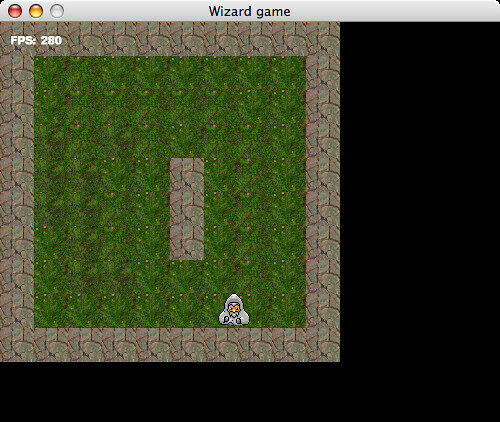 The first one will hold the native libraries needed for mac and the data the game’s data such as the game’s art. Unzip the contents of the file natives-mac.jar (from the /lib folder of where you unzipped the slick distribution) into the /natives-mac folder of your project. Also copy the rocks.png and the grass.png files (from the testdate folder) into your /data folder of your project. We will use these two files to create our map. I used the Tiled tool to create the map. The Tiled tool allows us to use images as tiles and create any map we want. 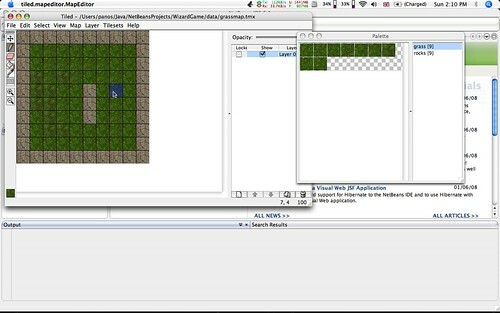 Run the tiled map by running the tiled.jar fie, create a new map (I created an orthogonal one with a 10×10 dimensions) and then create a new Tileset by choosing Tilesets -> New Tileset… Give it a the name grass since it will consist of grass tiles, tick the Reference tileset image tick box and choose the grass.png file in your /data folder. Create another tileset, call it rocks, choose the rocks.png file but also click on the Set Default Properties… button and add a property “blocked” and give it the value “true”. This property indicates that a rocks tile will block movement and it will be used later in our game to do collision detection. Once the tilesets are created click on the lower left corner to bring up the Paletter window. From there you can choose the tileset you want and create a map. I created a very simple map and saved it as grassmap.tmx in my /data folder. You can do it by right clicking on the project and choosing Properties -> Run and you will see the VM options text field. If you run this it should display an empty window; not very useful. Lets start then by first loading up the map we have created. The class TiledMap represents a tiled map. If you run the new code you should see the map loaded up. What else do we need? A sprite. I found loads of free game sprites to use here. I choose a wizard-like sprite, edited it a bit using seashore because I wanted a transparent background and saved them in my data/ folder. The next thing we have to do is to define the animation of the sprite. We want to constantly draw the images one after the other in order to create the sense that our sprite is moving. For this we should defined in our init method four Image arrays, each one containing the images for our movement, up, down, left and right. Note that we also defined a duration array. This indicates how ofter we want to draw our images when the sprite moves. The 300 and 300 (in milliseconds) values mean that we want to draw the first and second images every 300 milliseconds. These four Image arrays should be used for the animation of our sprite. For this we have to create an Animation object. * false variable means do not auto update the animation. * the user presses a key. // Original orientation of the sprite. It will look right. // The lower the delta the slowest the sprite will animate. If you run the above code you will see that you can move around the map. But you will also notice that you can move the sprite above the walls as well. We don’t want this. We only need to move the sprite where there is grass, otherwise we want it to stop. We should do collision detection on the rock tiles. To do these we can define a boolean two dimensional array which represents all blocks in our map. If the block contains a rock tile we set the value to true, otherwise to false. We can do this by reading the “blocked” property of our tile map we defined in the beginning.